Inclusionary housing is one of the urban interventions that are adopted by cities that mainly face with social-economic segregation among citizens in the housing context, with the aim of transforming urban settlements that are able to integrate low-income and any other vulnerable groups while promoting better quality and affordable housing for them. Reviewed literatures reveal that this target to be achieved requires top-down efforts; inclusionary zoning, inclusionary housing programmes and policies, as well as incentives for private developers, being the key tools. 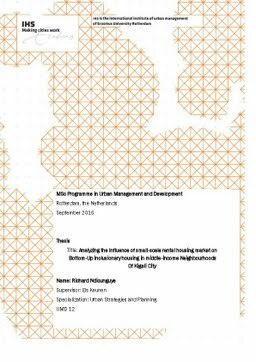 A deeper analysis discloses that this approach has not been adopted yet in cities of the developing countries that face with rapid urbanization and affordable housing shortage for the low-income groups, due to financial limitations and housing market forces that target middle to high income groups. However, looking at some middle-income neighbourhoods of some developing cities like Kigali, a considerable number of backyard houses are observed and mainly used to accommodate low-income and lower middle-income tenants in form of small-scale rental housing market. Therefore, this research intends to explain why this process takes place and to investigate to what extent provided houses are affordable and lead to the integration of low-income groups, hence the name bottom-up inclusionary housing.